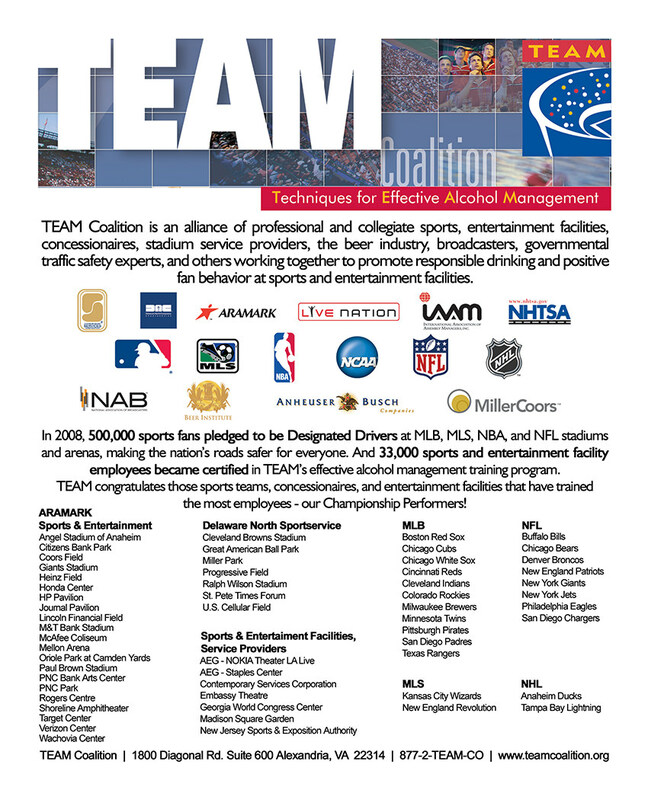 SMA became an organizational member of TEAM Coalition in 2010. 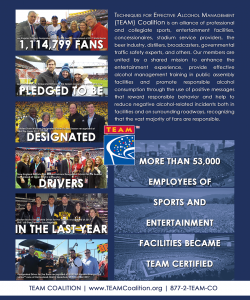 For more than 40 years, SMA has been dedicated exclusively to stadium operations and to the promotion of professional, efficient and state-of-the-art management of stadiums around the world. 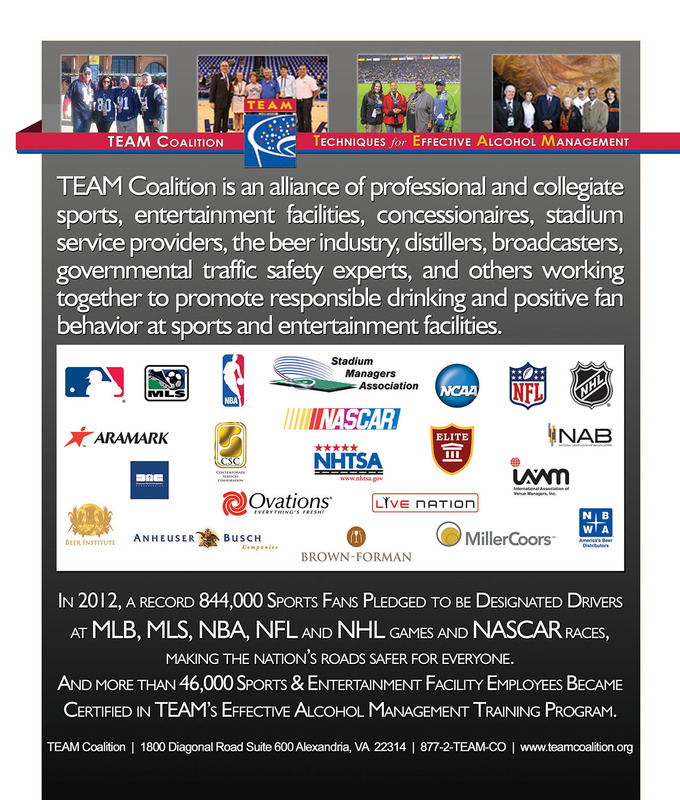 SMA members are administrators and operations personnel from teams, colleges and universities, facility managers and public sports authorities, and suppliers to the industry. 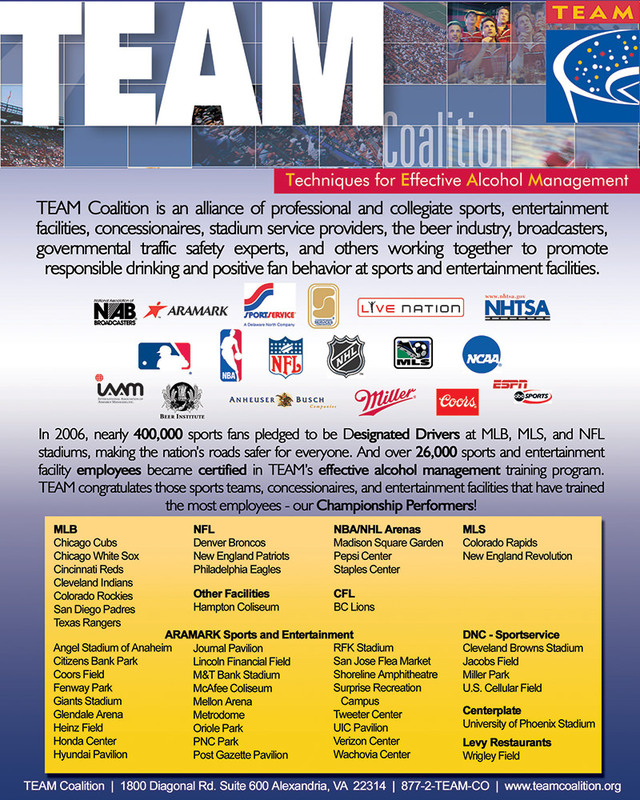 It is a member driven organization where stadium managers and vendors collaborate on issues and solutions that enhance the safety, profitability, and service of their facilities. 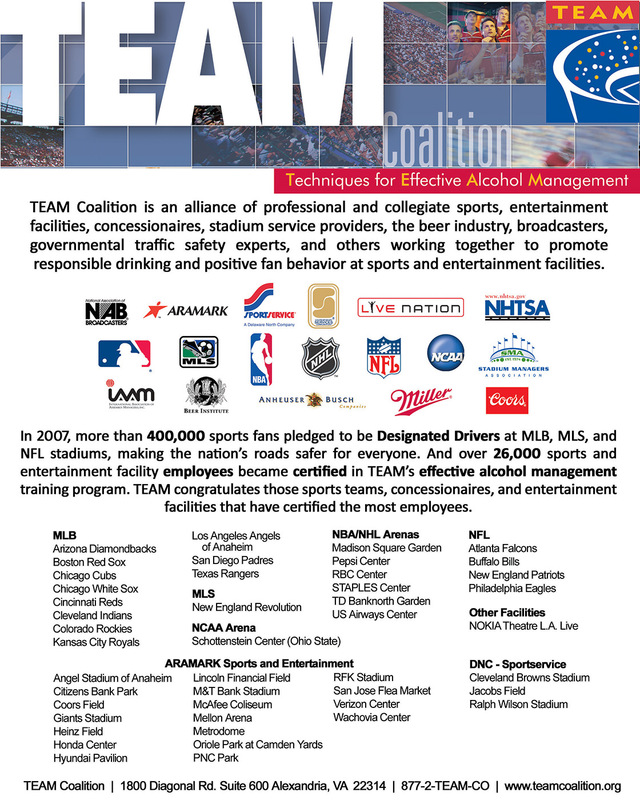 SMA and TEAM have worked together since 2002 to bring TEAM training and designated driver programs to a wider array of venues. 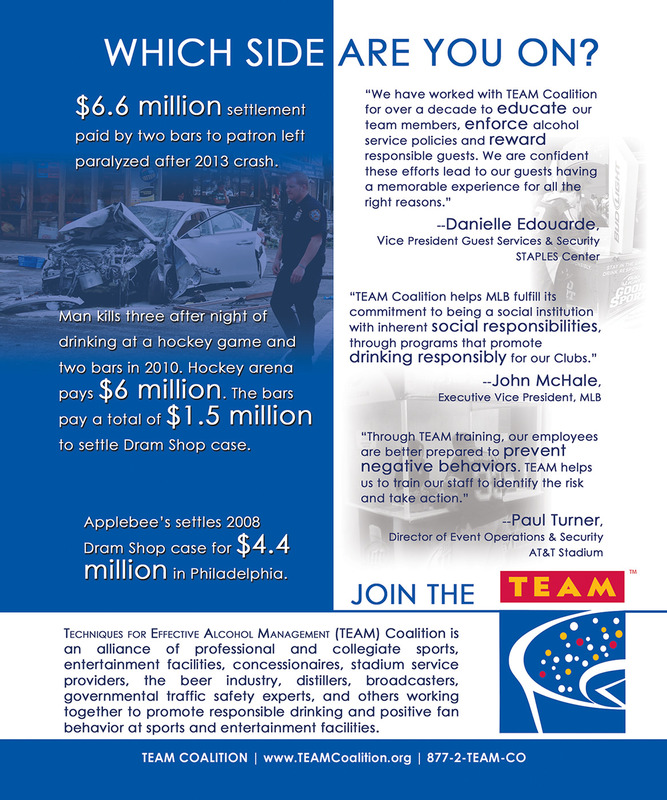 SMA members receive discounts on TEAM Training manuals for employees and trainer certification registration for facility managers. 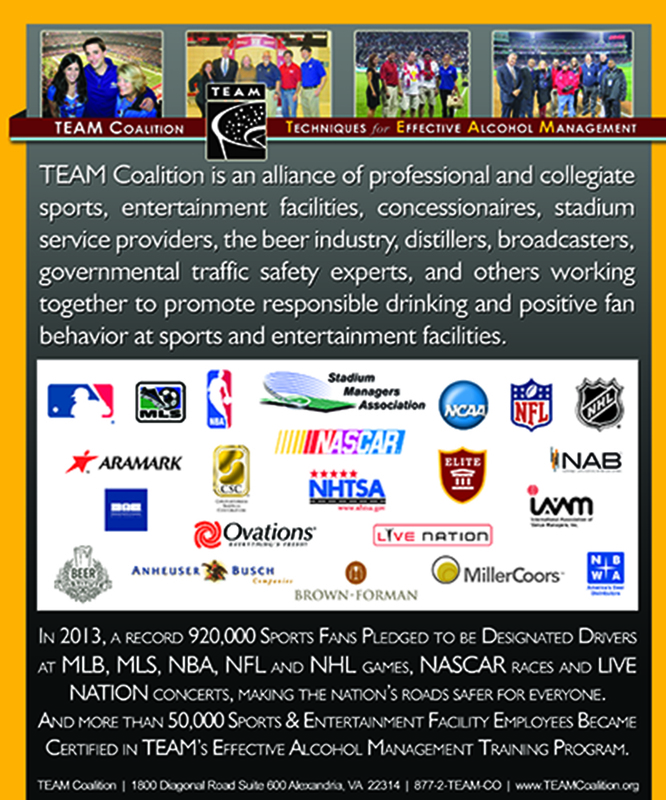 And TEAM has a long-standing offer to design and produce Fan Code of Conduct cards for any SMA member. TEAM attended the annual SMA Seminar in Huntington Beach, CA. TEAM attended the annual SMA Seminar in Fort Lauderdale, FL. 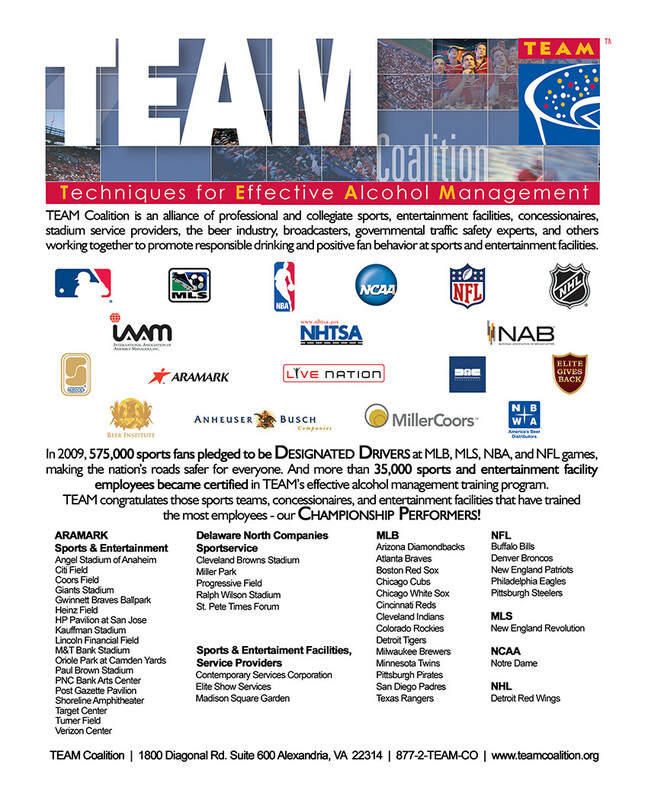 TEAM attended the annual SMA Seminar in Hollywood, CA. TEAM attended the annual SMA Seminar in Palm Springs. 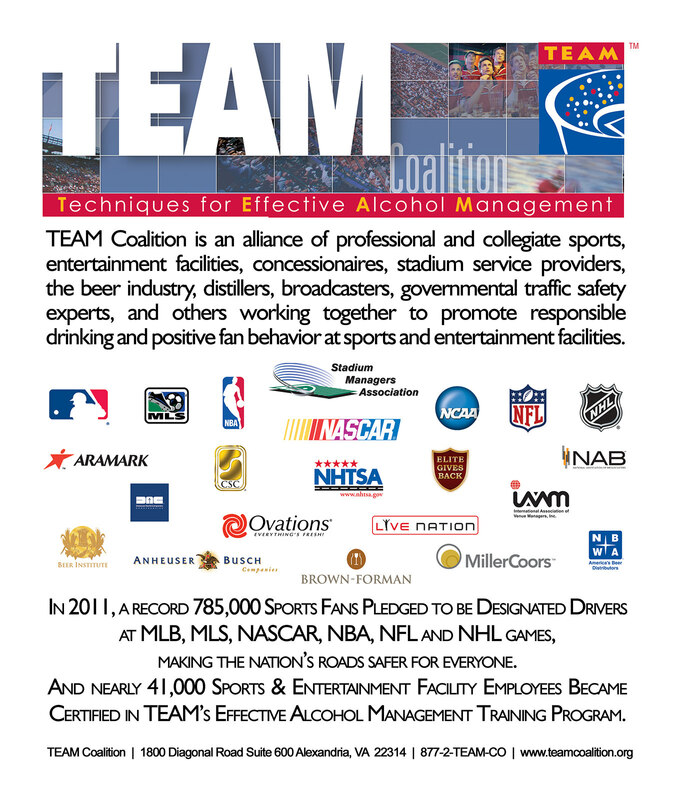 TEAM presented on best practices in alcohol management. TEAM attended the annual SMA Seminar in Miami Beach, FL. 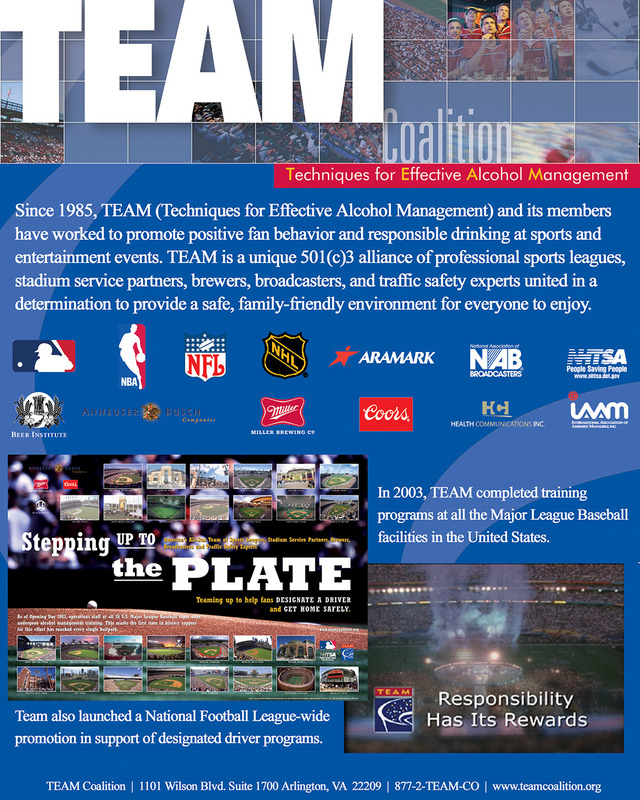 TEAM attended the annual SMA Seminar in Palm Springs, CA. TEAM attended the annual SMA Seminar in Orlando, FL. TEAM attended the annual SMA Seminar in Palm Springs, CA. 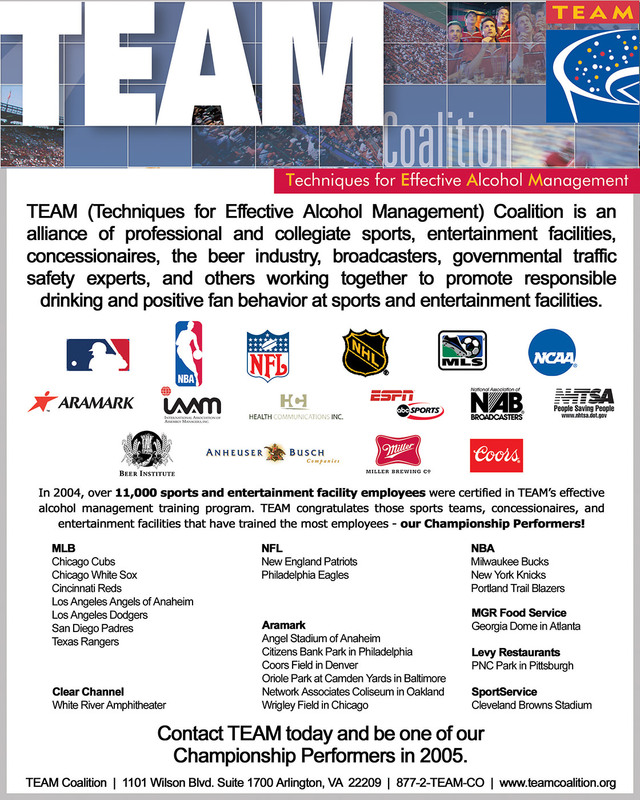 TEAM presented with representatives from Anheuser-Busch and MillerCoors on how the alcohol industry is supporting facility managers to promote responsible drinking. 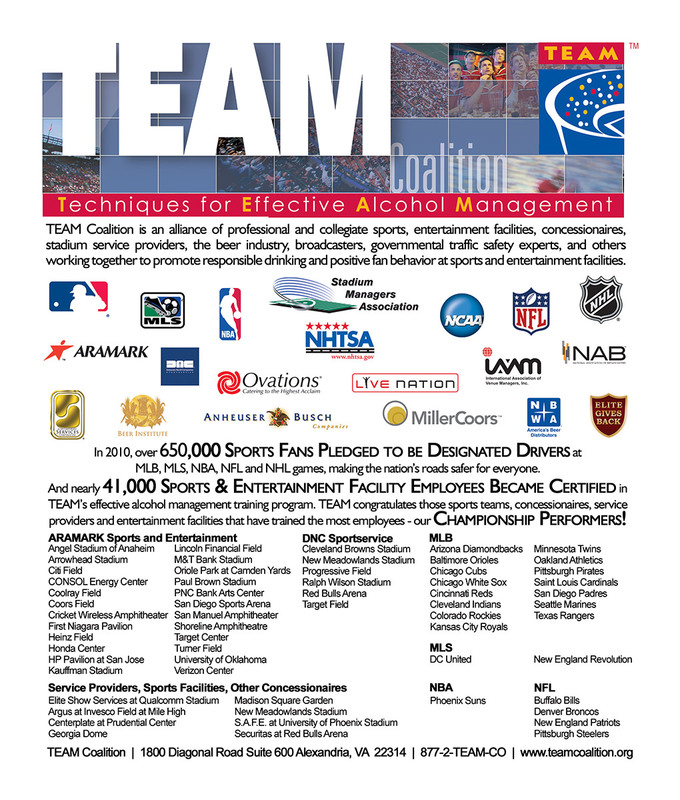 TEAM attended the annual SMA Seminar in San Diego, CA. TEAM attended the annual SMA Seminar in Key West, FL. TEAM attended the annual SMA Seminar in San Antonio, TX.